The second themed booster, World Martial Arts Tournament, comes out on September 21st! ●Focus on a single theme or story arc, in contrast to the series boosters, which collect characters from across the Dragon Ball universe. ●Unlike series boosters, which allow you to make even more powerful decks by picking and choosing cards from the same block or previously printed sets, you can build a variety of complete decks using just the cards from a single themed booster. To make this as easy as possible, we’ve included lots of cards with effects that trigger off of and resonate with each other. Of course, you can also use themed booster cards to power up your existing decks, but we designed the set to allow new players to enjoy powerful strategies simply by collecting a single set. 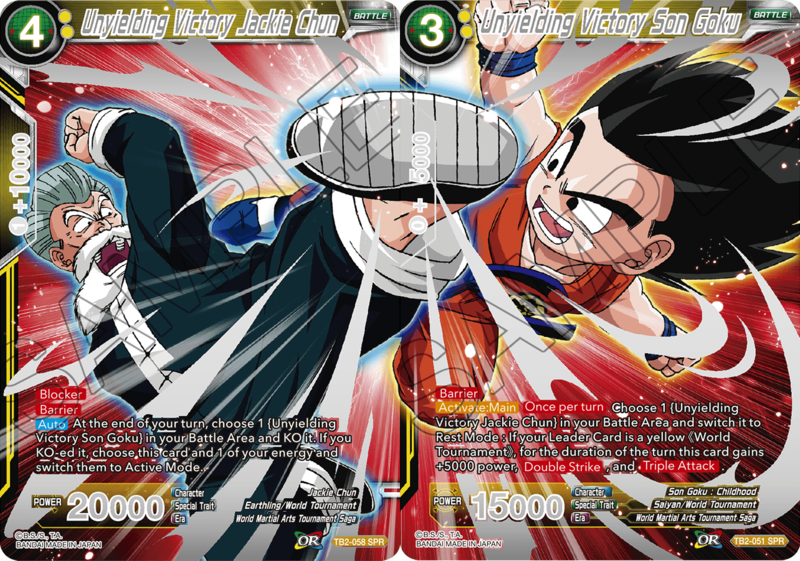 As the name suggests, this themed booster is focused on the World Martial Arts Tournament. Time and time again, the story of Dragon Ball hinges on this pivotal event, from Goku’s earliest adventures to the very end of the series’ story, making this a grand gathering of some of your favorite characters. In addition, each color is focused on a different tournament, allowing you to experience this momentous occasion across the ages. We’ve also created new Link Cards for this set, which are special paired cards whose art and effects link together. While many card games have featured cards with art split across multiple cards, we wanted to make sure that these cards were tied together mechanically as well. We hope that these cards inspire both players and collectors alike. Aim for victory while remembering the greatest moments in World Martial Arts Tournament history! Let’s take a look at our competitors! Red is focused on using the link between Goku and Vegeta to deal big damage—A very red strategy. The goal here is to play Vegeta, use his skill to play Goku and go in for a Triple Strike onslaught that ends the game. Even better: Once you have Goku and Vegeta in your Battle Area, they both get a power boost! Blue decks are focused on the link between Pan and Hercule, with a focus on card drawing and energy reuse to establish a rock-solid foundation. Play Hercule first, then play Pan to link their effects. 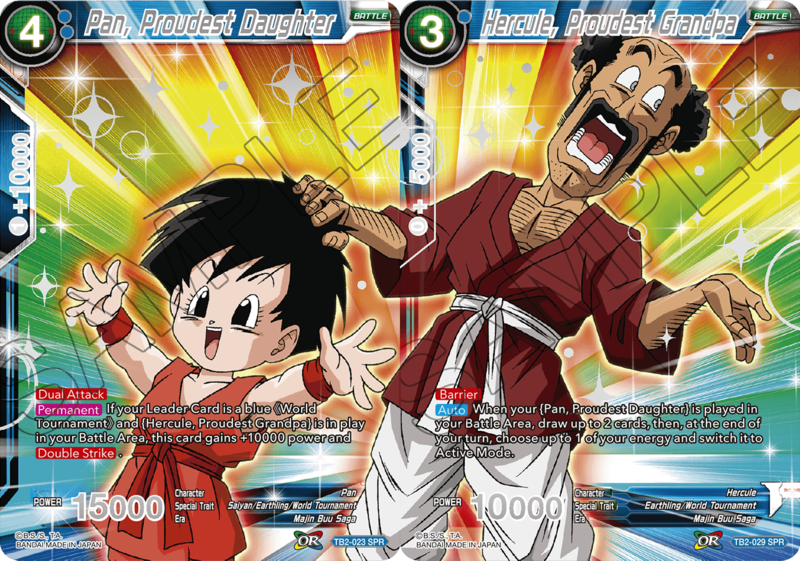 As long as Hercule is in play, Pan gets [Double Strike] when she comes into play and also draws you cards, preparing you for the battles to come! 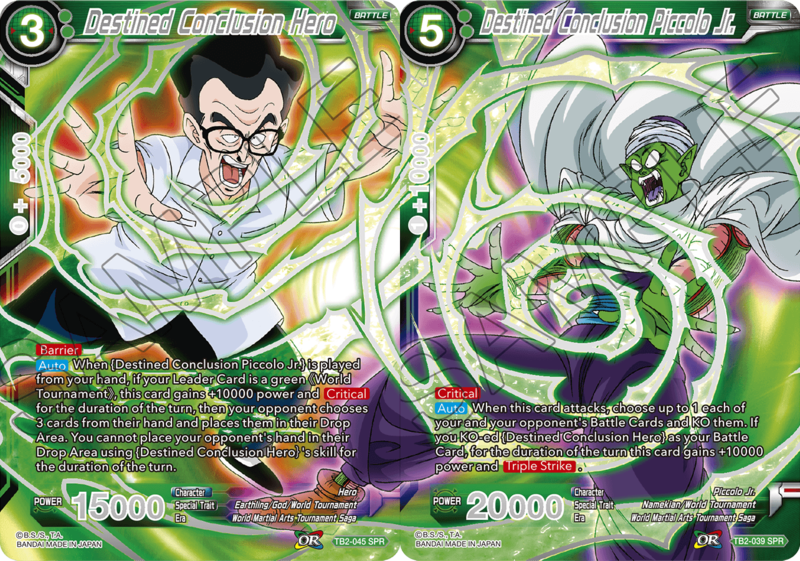 Green decks are oriented around using the link between Piccolo Jr. and Hero to thin out your opponent’s hand with critical damage and discard effects. Play Hero first, then drop Piccolo Jr. the next turn! As long as Hero is in play, Piccolo Jr. causes your opponent to discard 3 cards when he enters play, powers up Hero, and even gains [Critical]! And if that wasn’t enough, you can use Piccolo Jr.’s skill to KO Hero after he attacks, powering up Piccolo Jr. and giving him [Triple Strike]. Outwit your opponent and aim for the win! 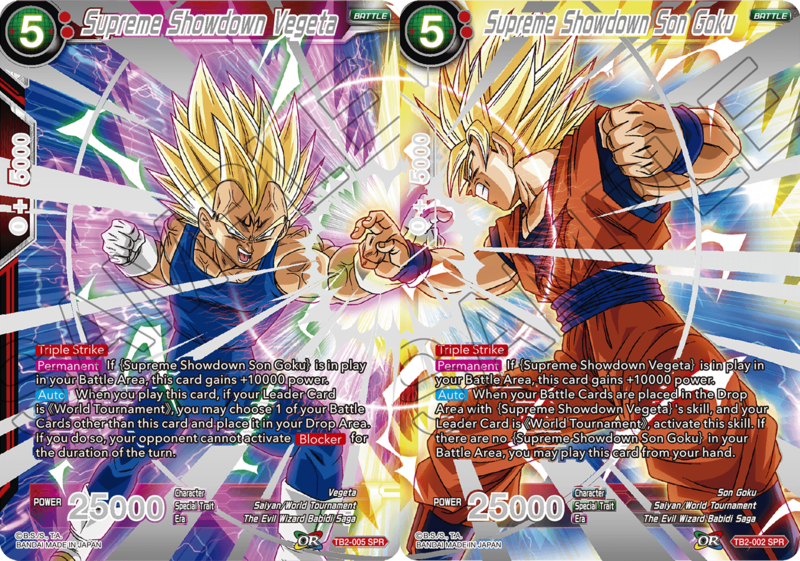 Yellow decks use the power of the link between young Goku and Jackie Chun to create an insurmountable offense from switching your Battle Cards to Rest Mode. Play young Goku first, then try to play Jackie Chun the following turn. As long as young Goku is in play, Jackie Chun can be used to give him [Double Strike] and [Triple Attack]! You can also activate Jackie Chun’s skill at the end of the turn to switch him and your energy to Active Mode and ready yourself for the opponent’s counterattack! 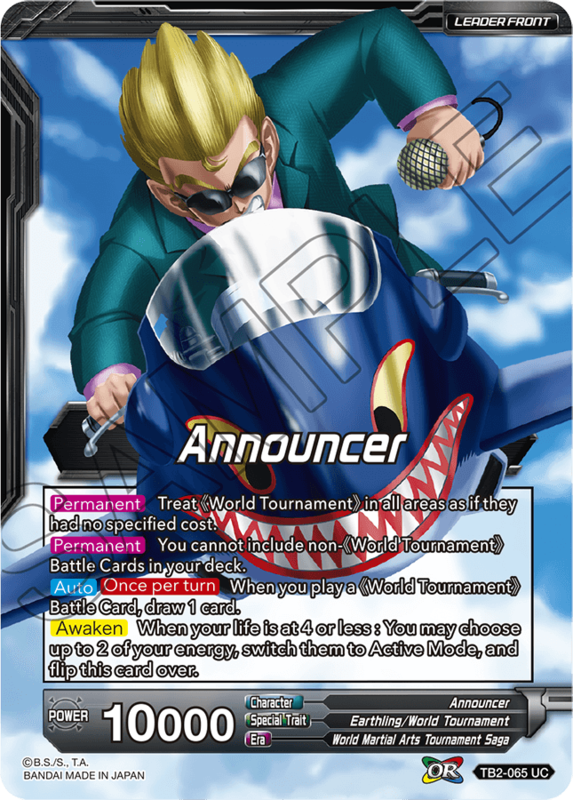 Black includes cards featuring the Announcer, who has presided over the World Martial Arts Tournament for the entire series! 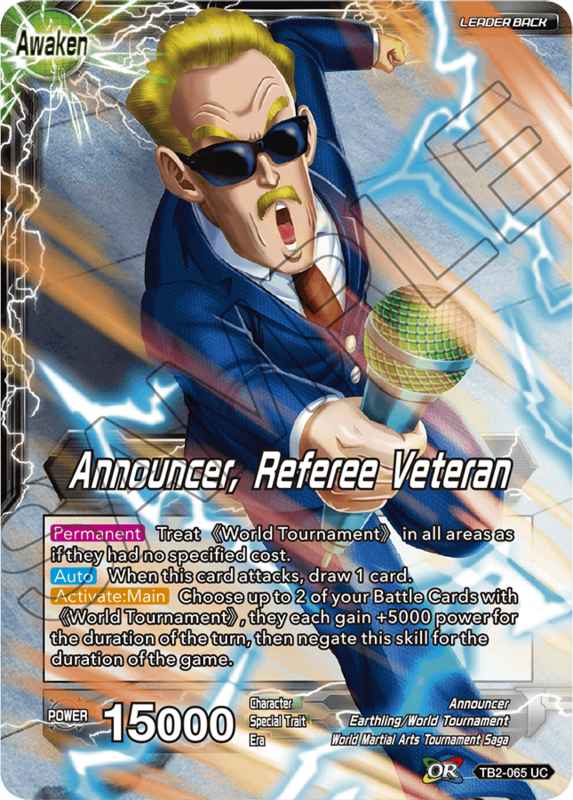 The Announcer Leader Card lets you ignore specified costs on all 《World Tournament》 cards. Pick your favorite cards from the set, and create your own specialized deck! As always, we’re striving to create a game that Dragon Ball fans and card game fans alike can enjoy. We hope you enjoy the new set!